Spring is officially here and what better metaphor for talking about growth than one that focuses so much about the promise of things to come. Ironically for many Canadian online brokerages, what’s to come may not be so favourable unless they learn to develop a digital green-thumb. In this edition of the roundup, we take a look at some fees sprouting up early in the spring that DIY investors will likely encounter more of as the year rolls on. Staying on the floral theme, we also take a look at a potpourri of client experience developments that form a very interesting arrangement of choices for the online brokerage industry to confront when it comes to delivering client experience in a digital world. As always, we’ve also got some chirpy comments from Twitter and the DIY investor forums to close things out. As the Canadian online brokerage market continues to adjust to a new competitor and new ways of competing, we anticipated seeing changes to the structure, scope and size of fees being charged for online brokerage services. 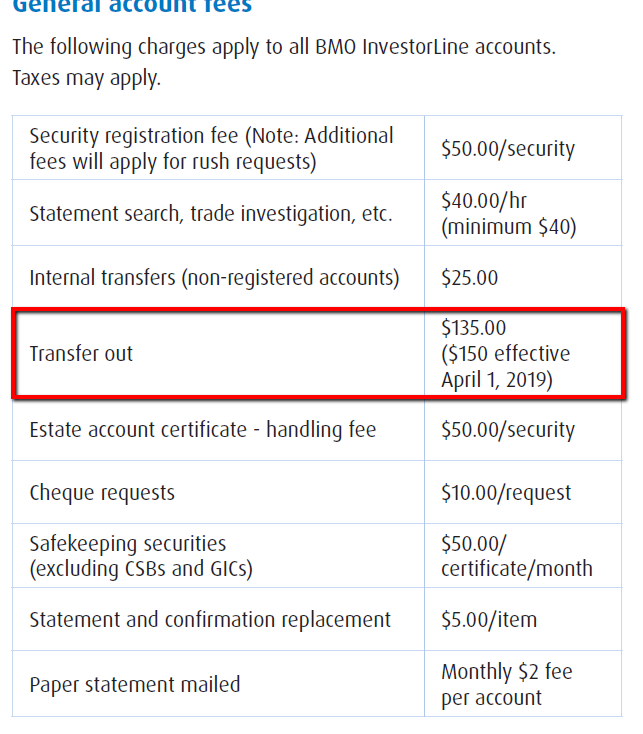 Earlier this month we noted a small change to the fees being charged by BMO InvestorLine that are set to take effect at the beginning of April, whereby they’re increasing the transfer out fee from $135 to $150. Among most of the big bank owned brokerages, the transfer out fees are $135 (the exception being Scotia iTRADE at $150 already) whereas at most non-bank-owned brokerages the transfer out fees are $150. Curiously, Wealthsimple Trade’s transfer out fee is $125 (as is Desjardins Online Brokerage’s). While it might not be high on the list of criteria DIY investors use to choose an online brokerage with, it is always prudent to understand what it costs to get money into and out of any account, including and perhaps especially investing accounts. The slight raise in fees here by BMO InvestorLine might also trigger other bigger peers to do the same. On the other hand, from a strategy perspective of the online brokerages, transfer fees might become an increasingly important lever with which to challenge other online brokerages when it comes to poaching customers. Case in point: a recent transfer-fee promotion launched by Questrade. While transfer fee coverage promotions are fairly standard, what made this promotion stand out was that there was no minimum balance transfer required to be eligible for a commission-fee rebate. This fairly aggressive maneuver could offer a favourable window to investors with assets under the usual $25,000 threshold to switch over and have their fees covered. Of course, the decision to switch online brokerages can certainly be challenged/impacted by the cost of doing so and if transfer fees were to increase, investors may think twice before switching away from a brokerage. At Qtrade Investor, for example, there is a cost of $100 to a client who closes an account within one year of opening it. That kind of fee is uncommon at most Canadian brokerages but it is easy to see how a DIY investor who was contemplating or who tried Qtrade Investor, would need a compelling reason to leave and incur a charge of a $100. With competition between Canadian brokerages now ratcheting up, hanging onto clients – whether it is through improving the service experience, or through charging more to leave – will likely be a more popular topic of discussion. As these exit costs do rise, however, the incentive to research online brokerages a little more closely also increases. So, before Canadian online brokerages go too far down that road, they should revisit the clarity of their value proposition for DIY investors and their plans for delivering a great client experience as falling short on those will also be why DIY investors would look to leave in the first place. When it comes to client experience for online brokerages, there are a couple of important moving parts. One is the traditional idea of “customer service” that DIY investors would come to expect from any financial services provider. Things like being able to contact an actual person when an important situation arises and have that interaction be effective and enjoyable are, in today’s digital world, becoming increasingly rare. Interestingly, this past week, Fido, the flanker brand to Rogers, announced that they would be charging clients $10 for client service requests on live chat or via telephone that could have been done by the clients themselves online or in some other automated fashion. Why this is relevant for the Canadian online brokerage space is because the “hands off” approach to service is a bigger trend that shapes expectations of consumers, especially younger and tech-savvier ones, and changes what “service” really means. In the financial services space, there are an increasing number of digital-only financial services providers (e.g. EQ Bank) and with the launch of Wealthsimple Trade, this very “hands off” digital service experience has now found its way into the DIY investing realm. One of the items that wasn’t discussed in our coverage last week of the launch of Wealthsimple Trade was the customer service experience. A final observation with regards to client experience in this increasingly digital age actually comes from a forum post on RedFlagDeals.com. The forum post itself started off having nothing to do with client service directly – it was a thread about transfer fee coverage from Questrade (mentioned earlier). Quite interestingly the conversation between DIY investors in the forum shifted from being about the transfer fee and turned instead to another firm altogether (Qtrade Investor) and the observation of a slow-to-load web page that created some pan-worthy display about the quantity of expertise and assets under management by the parent firm Aviso. Why this matters is because even though the web page eventually displayed the correct number, one consumer was able to shift a conversation away from transfer fees and talk about digital experience in a way that reflects the holistic manner in which technical design impacts brand experience and perception. Things like a fast loading website actually matter and may have become the digital equivalent of customer wait times on the telephone. For Canadian discount brokerages, this is clearly an interesting moment in their business model whereby “service experience” can mean something very different to different customer types. Figuring out how to cater to those different customer needs is no easy feat but it’s clear that trying to shift too much of the service to “online only” means investing heavily in speed, reliability and ease of use. And, in that light, brokerages who offer a multichannel service (including being able to speak to someone on the phone) experience seem like they can then show DIY investors where their commission costs go to. Are some things too good to be true? One DIY investor wants to know more about portfolios that guarantee the value of their investment. See what other forum users on RedFlagDeals had to say here. While there were a number of changes in the most recent federal budget, there was one that rattled investors in swap-based ETFs. Find out what got DIY investors buzzing in this reddit post. That’s a wrap on another eventful week. While spring officially rolled around this past week, the week coming up will undoubtedly be focused on someone who feels like they’ve just gotten sprung (aka the “Mueller Report”) by the “no collusion” report. Seems like there’ll be a whole lot more madness in the final stretch of March and almost certainly more uncertainty. Have a profitable week!